The San Jose Sharks will force the defending Stanley Cup champions to make another tough monetary decision. The Sharks signed restricted free agent defenseman Niklas Hjalmarsson to a four-year, $14 million offer sheet on Friday. 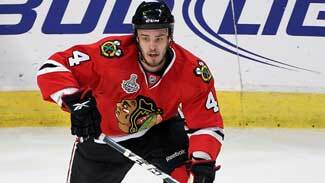 The Blackhawks will have seven days to match the offer. Hjalmarsson, 23, was a valuable member of Chicago's first Cup winner since 1961. In his first full NHL season, he registered 2 goals, 17 points and a plus-9 rating in 77 regular-season games. He then added 1 goal, 8 points and a plus-9 rating in 22 postseason games. That included a four-game sweep of San Jose in the Western Conference Finals. "We feel Niklas is a top-three defenseman in the National Hockey League," Sharks Executive Vice President and General Manager Doug Wilson said. "We saw his abilities first-hand in the playoffs last season and he was an important piece of a Stanley Cup-winning team. He is a solid player that would be a good fit on our team now and in the future." Hjalmarsson, a fourth-round selection by the Blackhawks in the 2005 Entry Draft, has career totals of 3 goals and 21 points in 111 regular-season games and 1 goal and 9 points in 39 playoff games. The Blackhawks have been paying the price for winning a championship in recent weeks, shedding salary by trading players such as Dustin Byfuglien and Kris Versteeg to try to get under the salary cap for the coming season. If they choose not to match the Sharks' offer to Hjalmarsson, they will receive San Jose's first- and third-round picks in the 2011 Entry Draft.